CHRISTMAS in 1968 – exactly 50 years ago – meant something beyond gift time for a crew of three aboard the Apollo 8. The mission was to be mankind’s first manned spaceflight that would leave radio contact and exit the line of sight of Earth – the deepest dive then possible into the unknown. They were to traverse to the dark side of the moon. 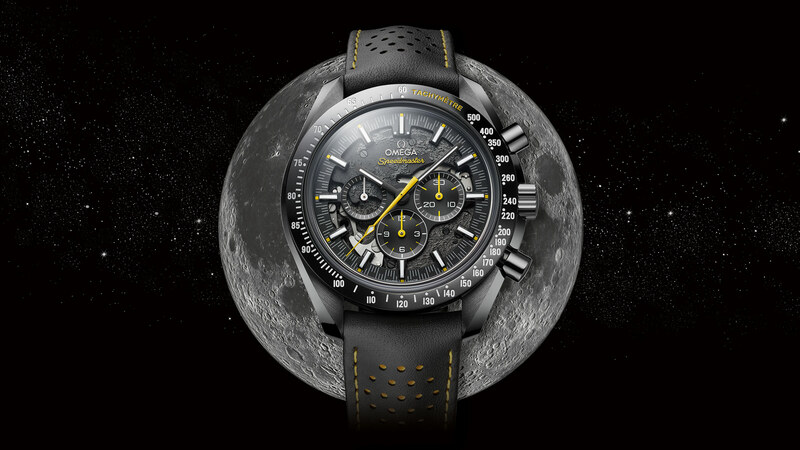 In commemorating that epic moment before the shuttle winked out of existence, Omega’s released a 50th anniversary Speedmaster aptly christened the Dark Side of the Moon Apollo 8 – and it’s everything an astronomy nut or horological fan will geek out over. Meteorite with yellow trim, indice tips, hands and highlights. While it carries the same pedigree as other Speedmasters, the true focus of the new piece is the laser-ablated plates in the movement that are fashioned to resemble the craters and crests of our lunar guardian. The rear of the movement receives the same treatment, too, and it sits in one of the most goosebump-inducing casebacks we’ve seen this year, largely due to the wording etched on it. “We’ll see you on the other side.” The words, uttered by command module pilot James Lovell, were the last uttered in exchange before the shuttle crossed the periphery of lunar orbit that would place them out of radio contact. They may well have been the final contact the crew had made – anything could have happened in the hours before they emerged from behind the moon. In that one line, express faith in the mission trumped any thought of martyrdom for science. The world watched, and waited – the program was the most-viewed programme globally at that time as, with bated breaths and skyward prayers, they pondered if Apollo 8 would make it. But triumph they did, striking one for mankind’s ambition and paving the way for Apollo 11, which would eventually land men on the moon. To learn more and own this piece of history, head over to the Omega website.